NASHVILLE, Tenn (WTVF) — After severe weather prompted flash flooding, several drivers found themselves stranded in flood waters. If you chose to drive through the water, car technicians have a warning for you. “It's never worth the risk of driving through water,” said David Drake Owner of Terry's Service Center. Drake said in his career he has seen his fair share of cars damaged by flood waters. “We see debris that gets lodge up in the wheels and a lot of times the breaks will start making noise, squeaky noises, things of that nature,” Drake said. With this week's heavy rainfall, many drivers found themselves stuck. Some made it out on the other side but at that point, Drake says the damage is already done. Drake also said it can cost you a pretty penny. “That can be anywhere from three to $10,000 depending on what you're driving,” Drake said. 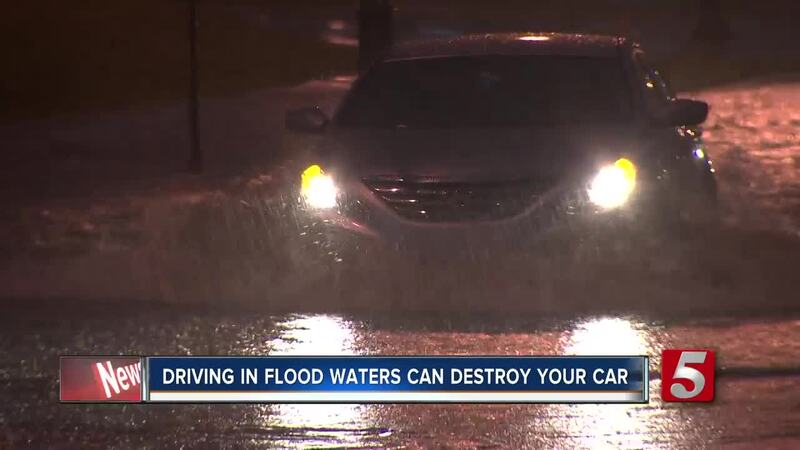 Mechanics say most drivers don't even realize they've damaged their car by driving through water until days, maybe even weeks later. “You can total your vehicle pretty quickly without even realizing it just driving through water,” Drake said. Drake says just a few inches of water can sneak into closed seals and ruin your car's electrical components, battery, transmission and more. “This is on the trans axle or transmission, so it's pretty low hanging; that's maybe 10 inches off the ground, so water can get in there pretty easily and when it does it doesn't take long for it to wreak havoc on a transmission,” said Drake. He also urges anyone who drove through high waters to get their car checked out immediately.